Schools and libraries need the financial support that the E-rate program provides for Internet access. Yet, the E-rate regulations can be daunting. At times, the individuals tasked with preparing applications feel overwhelmed by it all. It is hard enough to manage the bidding process and get a Form 471 application properly submitted; yet, certifying a Form 471 does not mark the end of the process -- it simply starts the next phase of the funding cycle. 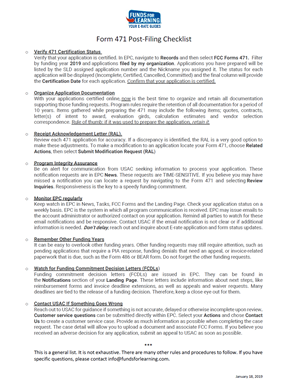 Funds For Learning has prepared a simple checklist to help applicants manage all those regulations and requirements. Whether you have certified your Form 471(s) already, or are just starting the application, this checklist can help you understand what lies ahead. Important note: E-rate rules and regulations are context sensitive and subject to change at a moment’s notice. This checklist is provided for your general reference. You should always check with the FCC and USAC for official guidance.